Flying cars similar to those depicted in Sixties cartoon ‘The Jetsons’ could be the future for longer journeys, a study has found. In the sci-fi animation, the Jetsons and their neighbours routinely zoom about in family-sized airborne vehicles. Several aerospace companies, including Airbus and Boeing, as well as the US space agency Nasa are now working towards making flying cars a reality. The VTOL (vertical take-off and landing) prototypes are driven by small and efficient electric propulsion units. Researchers have investigated how practical electric flying cars would be in terms of energy consumption and greenhouse gas emissions. 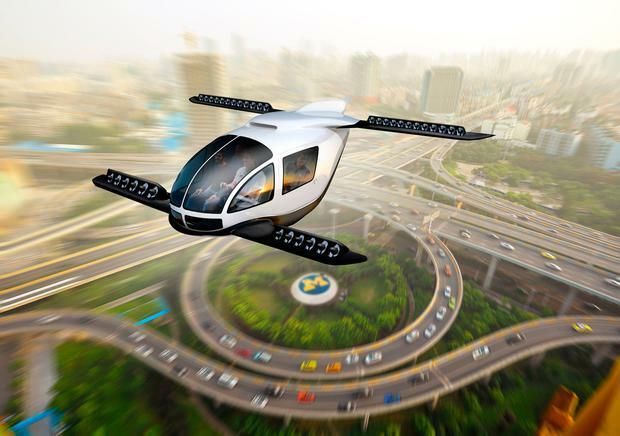 They conclude that for trips longer than 35km, flying cars would out-perform road vehicles. A team led by Dr Gregory Keoleian at the Centre for Sustainable Systems at the University of Michigan said although an electric flying car would produce no greenhouse emissions during flight, its batteries would require electricity generated at a power plant. Taking this into account, the study showed that for trips of 100km a flying car carrying a pilot and three passengers was greener than a road car. The scientists analysed the five phases of VTOL flight -take-off hover, climb, cruise, descent and landing hover. They found the craft used a lot of energy during take-off and climb but relatively little as they cruised at 150mph. As a result, they were most efficient on long trips dominated by cruising flight. For shorter trips, anything less than 35km, single occupant petrol-fuelled vehicles outperformed flying cars.